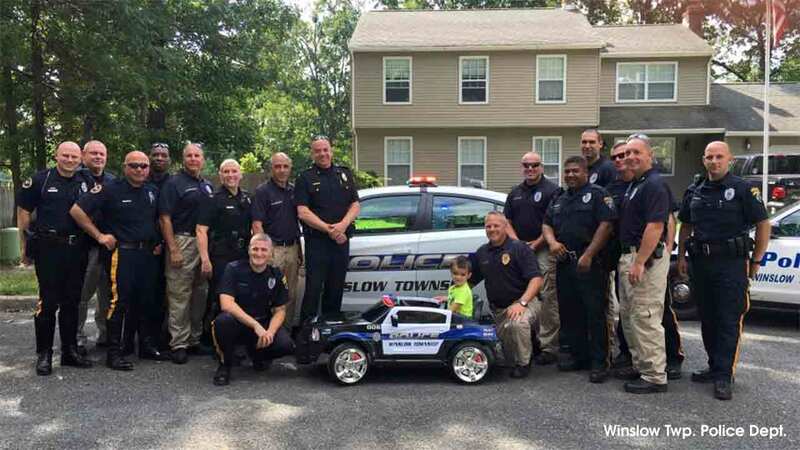 WINSLOW TWP., NJ -- A little boy in New Jersey, who bought lunch for police officers in his town, now has his very own police car, courtesy of the men and women in blue. 5-year-old William Evertz Jr. is a huge fan of police officers. So last week he delivered lunch to the officers at the Winslow Township Police Department. "William's actions are remarkable for anyone, let alone a 5 year old. Winslow Twp PD commends William for his acts of kindness and his parents for raising such a great kid," the Winslow Police Department wrote on their Facebook page. That day officers showed their appreciation by giving William a special police department shirt and other gifts. However, it seems they thought that wasn't enough.